Neither team was able to break the deadlock in Seattle on Wednesday night as Seattle Reign FC and the visiting Chicago Red Stars played to a 0-0 draw. The Week 21 midweek opener could have seen Seattle clinch a spot in the playoffs with a win, but after only picking up a point in the action, the Reign will have to wait for the rest of the week’s results to pan out to see if they can secure a spot in postseason play. Wednesday night’s draw puts the Red Stars at 30 points, tied with the fourth-place Orlando Pride on points in the standings. The Red Stars remain in fifth place in the table (the Pride hold the head-to-head tiebreak over the Red Stars), but have four games remaining to Orlando’s three. Hydration breaks were held at 15′, 30′, 60′ and 75′ during Wednesday night’s match due to poor air quality in Seattle. Though the game ended scoreless, there was no shortage of opportunities, set pieces and dangerous chances on both sides of the field. Just eight minutes in, Vanessa DiBernardo took a corner that Red Stars defender Julie Ertz was able to get a head on near the front post, but Reign goalkeeper Lydia Williams was covering the corner and got down in time for the save. In the 15th minute, Red Stars forward Sam Kerr got byline and cut back a dangerous ball after a free kick, but no one was in the box for the Red Stars to capitalize on the chance and the Reign eventually cleared it. Set pieces continued to be where Chicago looked most threatening. In the 18th minute, Morgan Brian peeled off and jumped Seattle’s defensive line looking to get on the end of a free kick delivery over the top from Danielle Colaprico. Brian hit the ball first-time and sent a volley towards the front post. Williams stopped the shot with a one-handed, diving save, but Brian was ruled offside. Williams made five saves in total on Wednesday night, and critical saves and recoveries from both goalkeepers proved pivotal in keeping things level. Red Stars goalkeeper Alyssa Naeher got her first test from the Reign in the 25th minute, when Reign defender Theresa Nielsen switched the field with a ball to Nahomi Kawasumi on the endline. Kawasumi sent a ball towards goal that forced Naeher to dive to deflect the cross. After a scramble with defender Julie Ertz to clear the danger, Naeher recovered the ball and ended Seattle’s chance. In the 27th minute, Williams made another big save for her side after Kerr connected with a corner from Colaprico right in the goalmouth. But Kerr hit the ball with her hands, so the play did not count. Kerr was called for a handball and received a yellow card after the play. Naeher was called upon to clear the ball away from her net a few more times before the end of the half. Fishlock made an effort to tap in a long ball from Morgan Andrews but Naeher got hold of the ball before the Seattle forward could make anything of the attempt. Naeher made another important recovery just three minutes later, running off of her line to collect a ball floated over the top by Kawasumi on a free kick. Whenever called upon, Naeher is there ? The Red Stars dominated offensively in the first half, getting off 14 crosses compared to the Reign’s two, and eight shots compared to the Reign’s two. The Red Stars got the first dangerous chance of the half in the 54th minute when DiBernardo rolled a ball across the face of goal and Kerr struck it from point-blank range. Once again, Williams showed up and blocked the shot to keep things scoreless. Seattle had a chance in the 59th minute when Reign forward Jodie Taylor ran onto a through ball that was slipped by the Chicago defense, but Naeher came out of her area early to collect the ball comfortably. '59 Attack life like @AlyssaNaeher attacks a ball in the 18-yard box ? The Reign followed up with a give-and-go chance just two minutes later between Taylor and Jasmyne Spencer, but the final shot of the combination went wide of the net. In the 74th minute, a turn-and-shoot effort from Kerr looked promising, but Allie Long got in the way of it in the nick of time and blocked her shot. Kerr had another chance six minutes later in a give-and-go with Rosie White after a quick transition that started at the midfield. The Red Stars forward sent the ball just wide, and Williams had her front post covered by the time Kerr got her shot off anyhow. In the final minutes of regular time in the second half, Fishlock came alive in front of the net, beginning with a left-footed rocket off of the post in the 82nd minute after a string of blocked Seattle chances. Fishlock got another shot off from close range just a few minutes later in the 88th minute, but she missed the mark again, hitting the side netting of Naeher’s goal. With a minimum of eight minutes indicated by the fourth official as regular time came to a close, the chances on goal were not nearly complete for either team. In the 95th minute, Williams punched away a service from DiBernardo following a short corner for the Red Stars. A long press by Chicago that followed ended in the 96th minute with a shot from Brian that Williams got down for comfortably. In the final minute of stoppage time, Spencer picked off a ball at the top of the 18 and served it into Adriana Leon, but Leon’s right-footed shot went just wide of the far post. Seattle Reign FC forward Megan Rapinoe missed the match after being added to the injury report on Tuesday with left hip soreness. The night finished with the Red Stars edging out the Reign in possession, having maintained 51.9% of the ball to the Reign’s 48.1%. With the draw, the Reign are now 10-4-7 overall and the Red Stars move to 7-4-9 on the season. The Chicago Red Stars will be back in action on Saturday night when they visit Portland Thorns FC on the road looking to steal three points to remain in the thick of the playoff race. Seattle Reign FC has a break this weekend before opening up Week 22 play against the Houston Dash on Tuesday night. Attempt missed. Adriana Leon (Seattle Reign) left footed shot from the left side of the box misses to the right. Assisted by Jasmyne Spencer. Substitution, Seattle Reign. Jaycie Johnson replaces Allie Long. Attempt missed. Morgan Brian (Chicago Red Stars) right footed shot from outside the box is close, but misses to the right. Attempt missed. Danielle Colaprico (Chicago Red Stars) right footed shot from outside the box is too high. Substitution, Chicago Red Stars. Michele Vasconcelos replaces Rosie White. Offside, Seattle Reign. Lauren Barnes tries a through ball, but Jodie Taylor is caught offside. Attempt missed. Jessica Fishlock (Seattle Reign) left footed shot from a difficult angle on the left is close, but misses to the left. Assisted by Theresa Nielsen following a set piece situation. Attempt blocked. Adriana Leon (Seattle Reign) right footed shot from outside the box is blocked. Adriana Leon (Seattle Reign) wins a free kick on the left wing. Offside, Seattle Reign. Allie Long tries a through ball, but Jasmyne Spencer is caught offside. Jessica Fishlock (Seattle Reign) hits the left post with a left footed shot from the left side of the box. Assisted by Theresa Nielsen. Attempt missed. Samantha Kerr (Chicago Red Stars) left footed shot from the left side of the box is close, but misses to the left. Assisted by Rosie White with a through ball. 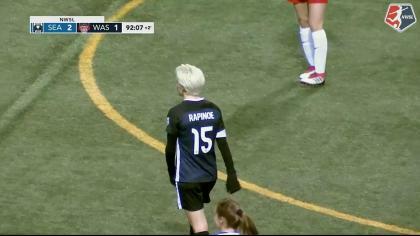 Substitution, Seattle Reign. Adriana Leon replaces Nahomi Kawasumi. Attempt blocked. Samantha Kerr (Chicago Red Stars) right footed shot from the centre of the box is blocked. Assisted by Vanessa Di Bernardo with a cross. Corner, Chicago Red Stars. Conceded by Morgan Andrews. Substitution, Chicago Red Stars. Sarah Gorden replaces Casey Short because of an injury. Delay in match Casey Short (Chicago Red Stars) because of an injury. Attempt blocked. Theresa Nielsen (Seattle Reign) right footed shot from the centre of the box is blocked. Assisted by Morgan Andrews with a cross. Attempt saved. Alyssa Mautz (Chicago Red Stars) header from the centre of the box is saved in the centre of the goal. Assisted by Samantha Kerr with a cross. Christen Westphal (Seattle Reign) wins a free kick on the left wing. Attempt saved. Samantha Kerr (Chicago Red Stars) right footed shot from the centre of the box is saved in the centre of the goal. Assisted by Vanessa Di Bernardo. Megan Oyster (Seattle Reign) is shown the yellow card. Offside, Chicago Red Stars. Arin Gilliland tries a through ball, but Rosie White is caught offside. Attempt blocked. Casey Short (Chicago Red Stars) left footed shot from the left side of the box is blocked. Assisted by Samantha Kerr. Corner, Chicago Red Stars. Conceded by Lauren Barnes. Offside, Seattle Reign. Jodie Taylor tries a through ball, but Allie Long is caught offside. Attempt blocked. Jessica Fishlock (Seattle Reign) right footed shot from the right side of the box is blocked. Assisted by Allie Long with a headed pass. Attempt missed. Samantha Kerr (Chicago Red Stars) right footed shot from outside the box is close, but misses to the left. Assisted by Vanessa Di Bernardo. Samantha Kerr (Chicago Red Stars) is shown the yellow card for hand ball. Hand ball by Samantha Kerr (Chicago Red Stars). Corner, Chicago Red Stars. Conceded by Theresa Nielsen. Attempt saved. Samantha Kerr (Chicago Red Stars) right footed shot from outside the box is saved in the centre of the goal. Assisted by Morgan Brian. Attempt missed. Morgan Brian (Chicago Red Stars) right footed shot from the centre of the box is too high. Assisted by Alyssa Mautz. Attempt missed. Rosie White (Chicago Red Stars) header from the centre of the box misses to the right. Assisted by Samantha Kerr with a cross. Attempt missed. 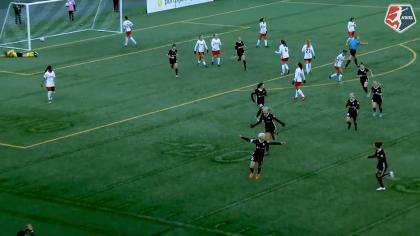 Jessica Fishlock (Seattle Reign) right footed shot from outside the box misses to the right. Assisted by Jodie Taylor. Attempt blocked. Danielle Colaprico (Chicago Red Stars) left footed shot from outside the box is blocked. Assisted by Vanessa Di Bernardo. Attempt saved. Julie Ertz (Chicago Red Stars) header from the centre of the box is saved in the bottom right corner. Assisted by Vanessa Di Bernardo with a cross. Attempt missed. Rosie White (Chicago Red Stars) header from the centre of the box misses to the left. Assisted by Samantha Kerr with a cross.